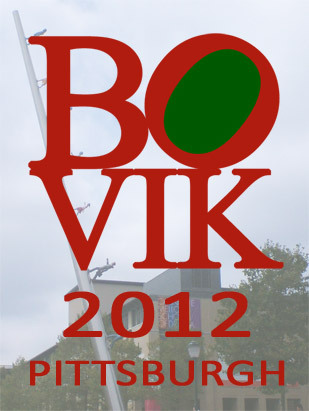 SIGBOVIK is a yearly conference celebrating the inestimable research work of Harry QQQ Bovik. Since his research has been so variegated, the conference is traditionally a forum for discussion on many subjects, including: Inept Expert Systems, Deep Space Navigation, Science, Perplexity Theory, Thaughmaturgic Circle, Self-Adjusting Computation, Denotational Semantics of Pidgin and Creole, Spatio-Temporal Clusters, Anomaly Detection, Structural Conformance, High-Content Screening, Natural Intelligence, Artificial Stupidity, Elbow Macaroni, Rasterized Love Triangles, Synergistic Hyperparadigmatism, Computational Archaeolinguistics, Discard-based Search, Hyper Driven Devices, and any other topic approved by the conference organizers. The conference will be held in Rashid Auditorium of the Gates-Hillman Center at Carnegie Mellon University in Pittsburgh, Pennsylvania. Directions to campus are available here; GHC is building #10 on the campus maps here. To stay up-to-date with the latest news, and to help us plan the number of attendees, RSVP to the SIGBOVIK 2012 event on Facebook. That event page may also be a useful place for out-of-towners to coordinate.